You've found the “U.S. Brahma Chicken Breeders” page here at Hobby Farm Wisdom! If this is the first time you have visited our site: Welcome! Brahma chickens are a common, very large breed of poultry that is predominately used for meat. Originally imported to the United States from China, this breed was the main source of poultry meat in the United States from 1850 to the 1930s. These chickens are one of the largest breeds with an upright carriage and large head. The males weigh an average of 12 pounds and the hens average 10 pounds. 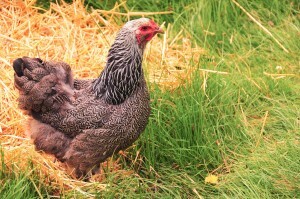 The Brahma breed produces eggs moderately well resulting in large, light brown eggs. They have a gentle disposition that lends itself well to being handled and does well in confinement. Specific varieties accepted vary by country but the varieties include light, buff, black, gold, dark, blue and blue combination.